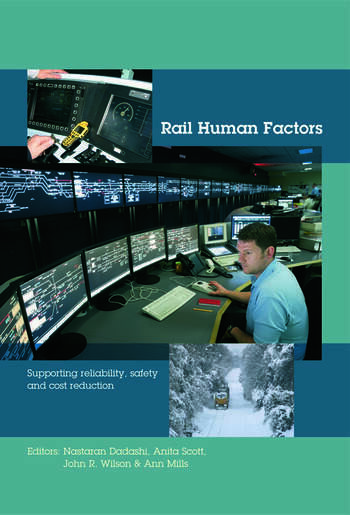 The rail human factors/ergonomics community has grown quickly and extensively, and there is much increased recognition of the vital importance of ergonomics/human factors by rail infrastructure owners, rail operating companies, system developers, regulators and national and trans-national government. This book, the fourth on rail human factors, is drawn from papers presented at the London 4th International Conference on Rail Human Factors. The contributions cover the range of human and organisational issues on the railway, from driving to signalling and control to maintenance and engineering work, to passengers and security issues such as trespass, and address improvements in safety, reliability, use of capacity, efficiency and quality. The book represents the best of recent work in rail human factors, and starts to define the framework for the next few years. As well as the human factors areas listed above, the conference and thus the book are notable for sessions on simulation in rail human factors and on human factors in metro design and operation. The book also reflects the increased attention being paid to, and developments in, understanding all aspects of rail stakeholders’ behaviour, and also the contribution of ergonomics/human factors to innovative network control systems which will enhance reliability, safety and use of capacity. The book will be of interest to a number of groups: those working in the rail sector from a human factors point of view; the larger rail industry and related bodies generally; and in terms of transferrable knowledge to ergonomists and human factors specialists working in other industries. Decision-making at level crossings – should a decision point marker be provided? Can you know if someone is too tired to drive safely? Human factors awareness training for incident investigators: What impact has it had three years later? Nastaran Dadashi is a research fellow within Human Factors Research Group, University of Nottingham. Her PhD, Human Factors of future railway intelligent infrastructure, was funded by Network Rail and was focused on adapting a cognitive approach to design and understand complex multi-agent systems within socio-technical environments. Currently she is working on a EU commissioned project, ON-TIME, that aims to improve the punctuality of railway services across different European countries by optimising the disruption management process. She has been involved with various rail consultancy projects, funded by industry and research council sponsors. Anita Scott is a Senior Human Factors Specialist and has worked at RSSB since 2006. Anita is the co-ordinator and manager for the Human Factors Research Assistant post which rotates on a yearly basis and is taken up by sandwich year students on psychology or ergonomics degree courses. She is currently working on a number of research and support projects for the rail industry on topics including: ERTMS, musculoskeletal disorders and implementation of new onboard systems and is a trainer for the Human Factors Awareness course for incident investigators. John Wilson is Professor of Human Factors at the University of Nottingham. He is also employed 50% of his time as Principal Ergonomist (Knowledge and Strategy) by Network Rail. He has held previous positions at Loughborough and Birmingham Universities in the UK, at UC Berkeley, USA, and was Head of the School of Risk and Safety Science at UNSW, Sydney, Australia. He has authored over 500 publications with more than 300 in refereed books, journals or conferences and is a Scientific or Associate Editor and on the Editorial Boards of five journals in human factors/ergonomics, and virtual environments, and has been Editor-in-Chief of Applied Ergonomics since 1991. Ann Mills leads the Human Factors Team at RSSB. Ann has an MSc and PhD in Applied Psychology from Cranfield University. She is a chartered psychologist and has been working in the field of transportation safety for the past 20 years. Prior to joining RSSB Ann worked as a senior researcher at Cranfield University for 6 years in the area of aviation safety working on projects funded by the Civil Aviation Authority, Joint Airworthiness Authority, Federal Aviation Administration & Shell. Ann also has experience working in communications research and the psychology of brand loyalty when she worked for National Opinion Poll (NOP).